The Titan Toolkit began its life as a simple five-button application for our team to more easily access UDK and join or host a game. It soon grew to something much more and now includes ticketing support, subversion and a file browser among many small time-saving features. Closing any active UDK windows. Any parameter defined inside the 'launch parameters...' textbox! Automatically finds all available game levels and list them as possible launch parameters. Show user IP to easily share with team. Access to Subversion client with Update and Commit. 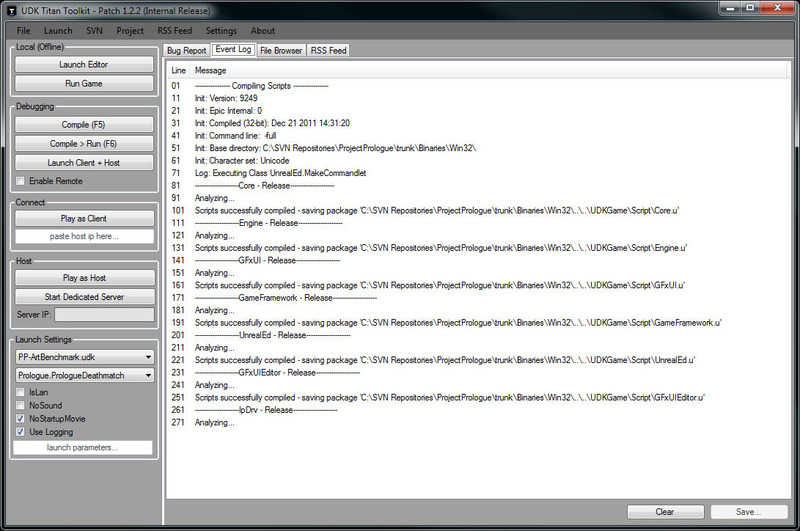 Easy Tool update through SVN. Event Log. Compile information is stored in the event log. File Browser. 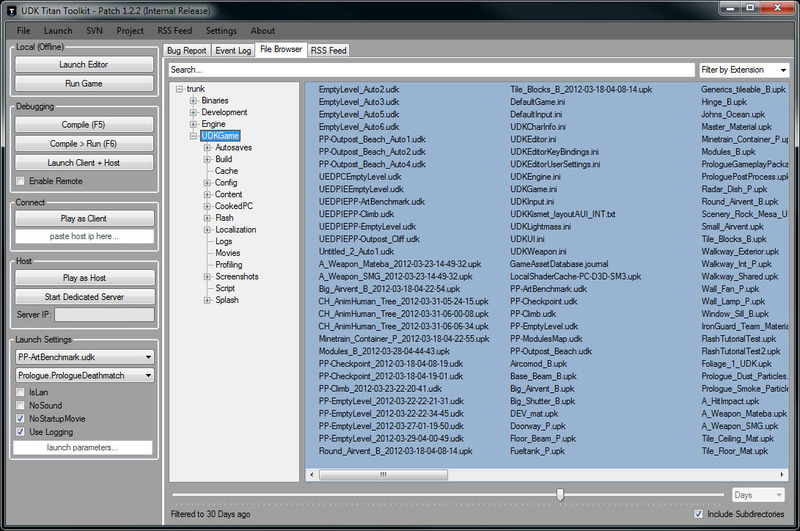 Quick access to any file in the UDK Directory. Filter by extension, name or file age! Search is live and multi-threaded. Easy access to any file in the UDK-directory. Keep track of compile events. Report bugs and include screenshots, logs and/or reproduction info. Quick access to many common user actions. 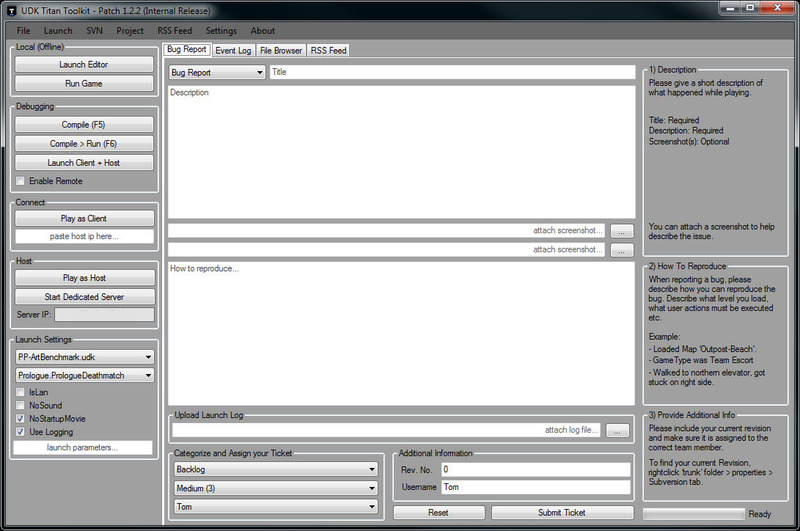 The tool turns most actions into a single button click, it stores user preferences and allows a single projectmanager to define global settings, these settings are automatically applied to every user The most commonly used features for the entire team include: Play as Client Play as Host Launch Editor SVN Update and Commit Bug Report File browser Development of this tool took about a week with intervals. It has since paid itself back numerous times as it makes every step easier and more accessible especially for less tech savvy artists.